LOOKY is made of a stretch fabric (polyester). Therefore the gloves will fit your hands tight and comfortable. For the best fit, we advice you to read the size table below. 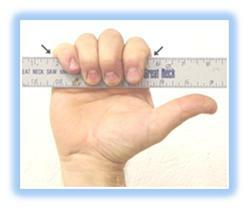 To determine the size of your hand, measure the width of the palm of your dominant hand. Your dominant hand is left when you're left handed and right when you're right handed. Since LOOKY is made of natural and vulnerable materials, the gloves need special care to keep the quality. The leather piece on the thumb side is best taken care of with products specially made for leather. The leather is a natural product and doesn't react good when using soap or washing-powder and forced drying.